. "Roméo LeBlanc". The Canadian Encyclopedia, 16 December 2015, Historica Canada. https://www.thecanadianencyclopedia.ca/en/article/romeo-a-leblanc. Accessed 23 April 2019. Roméo Adrien LeBlanc, CC, CMM, ONB, journalist, politician, governor general of Canada (born 18 December 1927 in L’Anse-aux-Cormiers, NB; died 24 June 2009 in Grande-Digue, NB). Roméo Adrien LeBlanc, CC, CMM, ONB, journalist, politician, governor general of Canada (born 18 December 1927 in L’Anse-aux-Cormiers, NB; died 24 June 2009 in Grande-Digue, NB). After a brilliant career in journalism, Roméo Leblanc served as a minister in the government of Pierre Elliott Trudeau before being appointed Speaker of the Senate and then 25th governor general of Canada (1995–99). He was the first Acadian and the first politician from the Maritimes to be appointed to the vice-regal position. Roméo LeBlanc studied at Université Saint-Joseph (now the Université de Moncton), where he earned a Bachelor of Arts (1948) and a Bachelor of Education (1951). He taught at Drummond High School from 1951 to 1953, then went to France to study French civilization at the Université de Paris. Returning to Canada, he held a professorship at the New Brunswick Teachers’ College in Fredericton from 1955 to 1959. In 1960, LeBlanc joined Radio-Canada, where he worked as a correspondent in Ottawa (1960–62), the United Kingdom (1962–65) and the United States (1965–67). In 1965, he founded the CBC/Radio-Canada Foreign Correspondents’ Association. 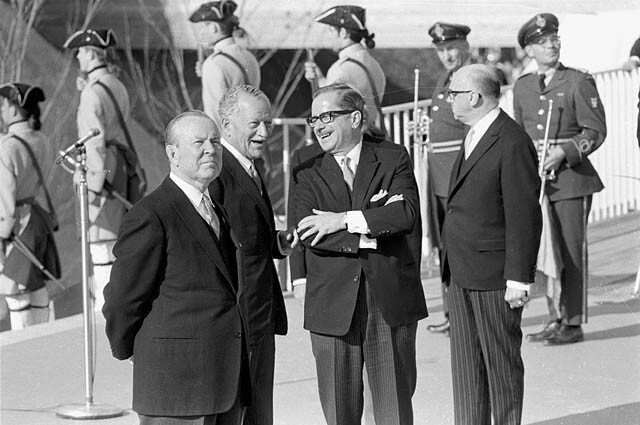 LeBlanc became press secretary to Prime Minister Lester B. Pearson in 1967, retained this position in the government of Pierre Elliott Trudeau until 1971, and then accepted a job as Director of Public Relations at the Université de Moncton. Elected to the House of Commons as Liberal Member of Parliament for the riding of Westmorland-Kent (New Brunswick) in 1972, LeBlanc became minister of State for Fisheries in 1974. In 1976, he was appointed minister of Fisheries and the Environment. He was re-elected in 1979 and again in 1980. After the fall of the short-lived Progressive Conservative government of Joe Clark, LeBlanc returned to the Department of Fisheries and Oceans in 1980; he ultimately became the longest-serving holder of the fisheries portfolio. In this capacity, he oversaw the expansion of Canada’s territorial waters from a limit of 12 nautical miles to the current limit of 200. In 1982, he became minister of Public Works and minister responsible for the National Capital Commission and the Canada Mortgage and Housing Corporation. In 1984, Roméo LeBlanc decided not to run again for the House of Commons, and on 29 June, Prime Minister Trudeau appointed him to the Senate. He sat on the Senate committees on Internal Economy, Budgets and Administration and Foreign Affairs, as well as on the Senate Subcommittee on National Security and Defence. At the same time, he was a Visiting Scholar at the Institute of Canadian Studies at Carleton University in Ottawa. He was also a part-time professor of Canadian studies at Concordia University in Montréal. On 7 December 1993, he became Speaker of the Senate. Acadian and fluently bilingual, LeBlanc was appointed governor general of Canada by Prime Minister Jean Chrétien in 1994, to succeed Ramon Hnatyshyn, and took office on 8 February 1995. He thus became the first politician from the Maritimes and the first Canadian of Acadian origin to hold the vice-regal position. LeBlanc’s appointment as governor general was not without controversy. The Reform Party of Canada, led by Preston Manning, and the Bloc Québécois, led by Lucien Bouchard, were quick to attack what they saw as Jean Chrétien’s flagrant favoritism toward a Liberal politician and organizer of many years’ standing. Roméo LeBlanc had not only been one of the few Liberal ministers to support Jean Chrétien’s bid for the leadership of the Liberal Party in 1984, but had also been a member of the election-strategy team that helped bring him to power in 1993. Despite these stormy beginnings, Roméo LeBlanc’s term as governor general was marked by several achievements related to recognizing citizen involvement and Aboriginal peoples, promoting Canadian history, and supporting the Armed Forces. For example, in November 1995, he created a new award, the Governor General’s Caring Canadian Award, to recognize “the everyday courage and dedication of ordinary people who have made extraordinary contributions to their families, communities or country.” It was also during his term of office that the Governor General’s Awards in Visual and Media Arts were established in 1999, in partnership with the Canada Council for the Arts. On 13 June 1996, Roméo LeBlanc issued a royal proclamation making 21 June National Aboriginal Day, a form of recognition that various Aboriginal groups had been demanding for many years. This day celebrates the unique heritage, diverse cultures and outstanding achievements of First Nations, Inuit, and Métis peoples in Canada. As governor general, LeBlanc also signed the royal proclamation officially establishing Nunavut as a new territory of Canada on 1 April 1999. LeBlanc also helped to make Rideau Hall more accessible to Canadians. Visiting hours for this large estate were extended, and starting in July 1996, the public could visit the State rooms, as well as the gardens and greenhouses. A visitor’s centre was opened in May 1997, and programming for visitors was expanded to include children’s workshops, costumed guides, and themed demonstrations. The number of visitors to Rideau Hall tripled during LeBlanc’s term in office, from about 40 000 to about 125 000 annually. 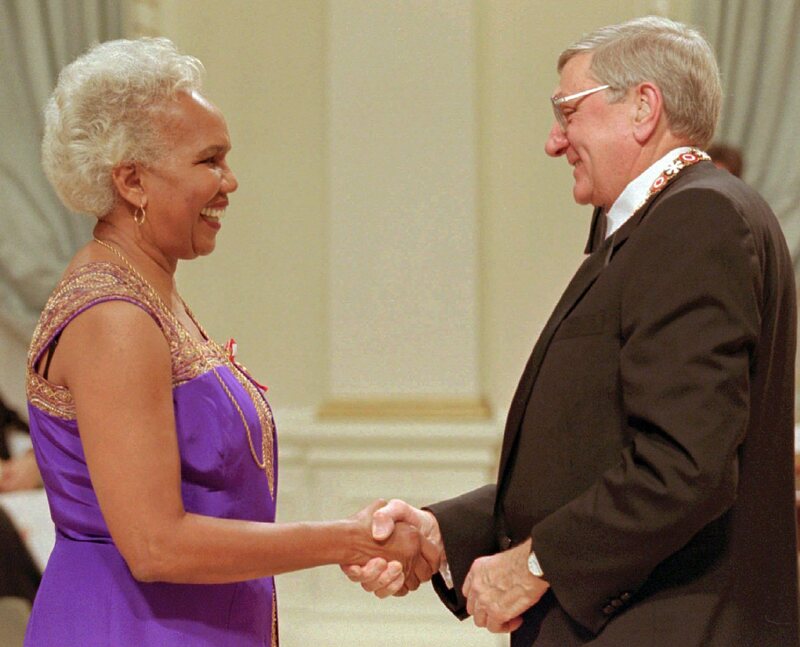 On 7 October 1999, Roméo LeBlanc was succeeded as governor general by journalist Adrienne Clarkson. He went back to live in New Brunswick, where he spent the last years of his life. From 2001 to 2004, succeeding Acadian author Antonine Maillet, he served as Chancellor of the Université de Moncton. In 2005, the Roméo LeBlanc Chair in Journalism was established at this university to honour one of its most illustrious alumni. When LeBlanc died in 2009, he received a State funeral at Saint Thomas’s Church in Memramcook, New Brunswick, with Governor General Michaëlle Jean, Prime Minister Stephen Harper and former Prime Minister Jean Chrétien in attendance. In February 2010, the Canada Post Corporation issued a stamp bearing LeBlanc’s likeness and featuring the flags of Canada, New Brunswick and Acadia. A park in Memramcook was also named in his honour. In 2011, the undergraduate scholarships awarded by the Université de Moncton were named after him. Roméo LeBlanc’s son, Dominic LeBlanc, is a lawyer and has been a Member of Parliament for the riding of Beauséjour, New Brunswick since 2000. In 2008, he was one of many candidates competing to succeed Stéphane Dion as leader of the Liberal Party of Canada, but withdrew his candidacy before the race was over and threw his support to Michael Ignatieff. Roméo LeBlanc was married to Diana Fowler. Nathan Tidridge, Canada’s Constitutional Monarchy (Dundurn, 2011). Margaret MacMillan, Marjorie Harris and Anne L. Desjardins, Canada’s House: Rideau Hall and the invention of Canadian home (Alfred A. Knoff Canada, 2004). Naomi E. S. Griffiths, The Golden Age of Liberalism. A portrait of Roméo LeBlanc (Lorimer, 2011).